Manufacturer of a wide range of products which include heat exchangers, heat exchanger for dairy products, pharmaceutical heat exchangers and heat exchanger for ceramic tiles. We are the figured affiliations, which is incorporated in offering an enormous degree of Heat Exchangers that are extensively used as an issue of air compressors cooling tubes and mechanical electric air radiators. 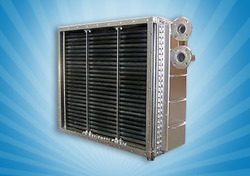 The offered heat exchanger are manufactured using the best quality unrefined material and advanced frameworks as per the all sectors norms. In order to avoid any default, our gave heat exchanger are accurately attempted by our quality examiner on varying quality measures. With the aid of our highly experienced professionals, we are instrumental in developing finest grade Heat Exchanger for dairy Industry. We bring forth the individually gasketed heat exchanging equipment that is ideal for sugar industry and offers remarkable performance in rendering very high turbulence and low fluid velocity. Demanded widely for its space saving design the innovative range of heat exchangers are equipped with factory tested components and assure 35% of reduced fuel consumption with its performance. We are renowned firm developing widely demanded Pharmaceutical Heat Exchangers. Widely used for energy conservation the revolutionary range of our offered heat exchangers is becoming widely popular to heat liquid or to generate heat for industrial processes. The offered model is developed as per set industry standards for manufacturing robust quality steam heat exchangers. Featuring assurance of longevity and hassle free operation these sturdy quality heat exchangers are equipped with aluminum extruded finned tubes and can be ordered from us in varied sizes at a leading price. We have gathered huge recognizance by developing highly demanded Heat Exchanger for ceramic tiles industries. Owing to our years of R&D activities we have pioneered the industry by presenting the most advanced range of heat transfer systems featuring remarkable performance in conduction, convection and radiation of heat. Designed to exchange thermal energy between physical systems the offered equipment is widely utilized in oil, gas, power and process applications. Further, we stock a wide range of innovative heat transfer systems in different configurations that can be ordered from us at a leading price.